You’ve heard this line so many times that you’re almost convinced there’s no helping your adult dog’s demeanor every time he goes to the veterinarian. You know how it is. The minute you and your dog walk into the clinic, he starts barking up a storm at the other animals in the waiting lounge. The minute you and your dog walk up to the veterinarian, he snarls bloody murder. The experience is both embarrassing and exhausting. But while it is true that it’s easier to curb behavior during puppy stage, your adult dog is never too old to learn. All you need is a plan. Before you can draft a plan, you have to first look into the root of the problem. 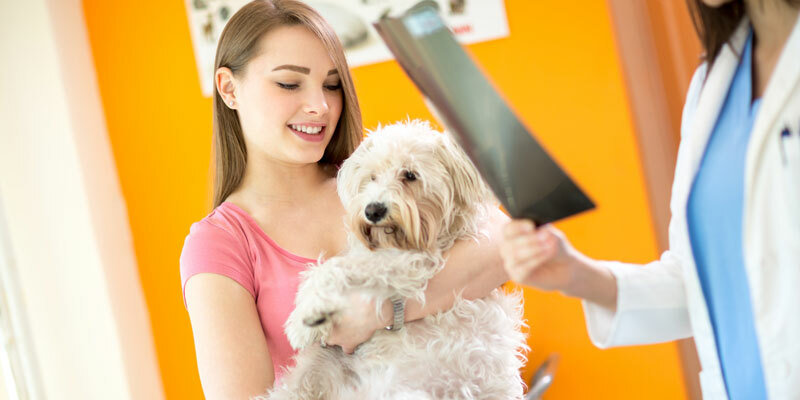 There should be a reason why your dog lacks the social skills necessary for a comfortable routine check-up. Put yourself into his paws. According to Dr. Dawn Ferera, associate veterinarian at Eastern Shore Animal Hospital in Chestertown, Md., “Your pet is likely to be reacting to the other animals’ pheromones and other smells in the clinic which lend to instill fear and anxiety.” A dog’s sense of smell is very powerful. Taking in these foreign scents all at once can be overwhelming, thus, putting him on defensive mode. No matter how nice the veterinarian is, your dog appears to detest her. This isn’t really as puzzling as it seems. “I have had pets with ‘white coat syndrome,’” said Dr. Krista Magnifico of Jarettsville Veterinary Center in Baltimore, Md. If your dog has had a traumatizing experience with a doctor when he was younger, this feeling of distress can easily be carried on to his next doctor. Every white-coated stranger is now out to poke, prod, and hurt him. Make behavioral training a rewarding experience for your dog. Socializing 101: Way before his scheduled check-up, take your dog on several trips to the park where he can be around other dogs and people. If he wasn’t able to play with other puppies when he was younger, this should be an invigorating exercise for him. Simple commands: Getting your adult dog to obey cues like ‘Sit’, ‘Stop’, ‘Lie down’, ‘No’ may sound a bit daunting. But with constant reminders and consistency, he will be able to catch on. An adult dog can be pretty sharp and, most times, he wouldn’t want to disappoint you. Play doctor: Instead of the usual cuddling or roughhousing, come up with a game where you get your dog to lie down, peek in his ear, in his mouth. You can even tickle-poke him with a finger to simulate a vaccine shot. Make the game fun for both of you. Short leash training: Take your dog on walks on a short, loose leash. Make him understand that the short leash is meant to keep him close and not to exact control. You can do this by gently tugging instead of yanking. “It will be like a doggie daycare treat where your dog can learn to acclimate to the clinic and staff,” Magnifico added. Rewards: Throughout your dog’s training period, keep some treats on hand to reward him for obeying a command and generally exhibiting good behavior. Nothing gives motivation quite like a prize. Even with enough preparation, you should still be at the ready just in case things go awry on the big day itself. Brand new triggers — say, a noisy puppy or a different clinical test — can easily throw your dog’s recent behavioral training out the window. It’s important that you learn to read your dog’s body language in the waiting room or on the examination table. Be observant and catch the telltale physical signs that your dog is already teetering over the edge of stress. However, being able to read your dog is just the tip of the iceberg. You should know how to properly react and respond to a stressed dog, too. We always seem to think that the best way to discipline a dog is to show him who is boss. But a lot of veterinarians are campaigning otherwise. Here are some tried-and-tested tips and tricks on how to handle a harassed dog. The only way to handle a stressed dog is by providing them a positive experience. This isn’t the time to battle it out with your dog on who gets to claim alpha position. Your dog is battling with his own emotions as it is. The best way to get him to listen to you is to become the loving, protective friend that you are using positive reinforcement. What is positive reinforcement? According to dog trainer Victoria Stilwell in her article, "What is Positive Training?" So what can you do to keep things positive for your dog at the vet's office? Dog Toys: Bringing your dog's favorite toy or blanket offers a distraction from any distressing triggers. Dog Treats: When your dog's mellowed down and begins to listen to your verbal cues again, reward him for it. Touch: You’re your dog's comfort zone right now. Rub his chin, soothe his fur, give him loads of affection. Reassure your dog: He may not understand your words, but he can sense comfort in them. Throwing in a “Good boy!” for his improved behavior will also boost his confidence. 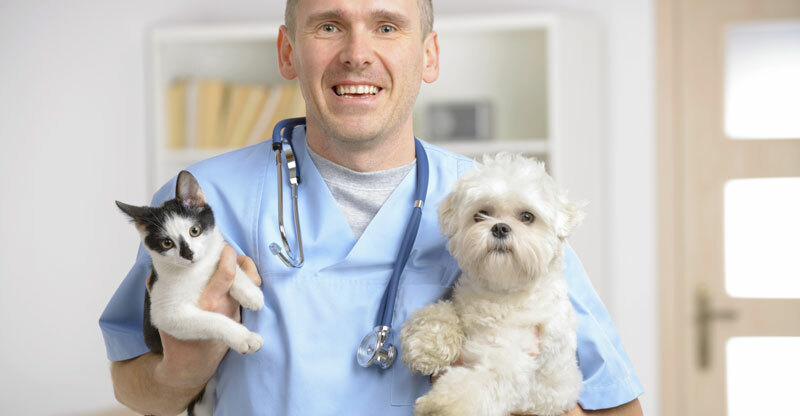 Involve your Veterinarian: Usually, when your dog acts up in public, the first thing you want to do is take him home rather than face the music alone. This does not need to be the case. Remember that your vet is a part of your team. Dr. Denise Wilson has this to say, “Your vet is very experienced with animal body language. So he or she would know the best way to try and win your dog over.” “I’d give him lots of treats and turn the visit into a fun one!” Magnifico said, an expert who has had her fair share of furry patients with behavioral issues, said. Don’t Worry: If you think you’re good at reading your dog’s body language, well, your dog has perfected reading yours. He can feel when you’re agitated, which only adds to his anxiety. Keep calm and your dog will try and be the same. A happy, well-behaved dog leads to a happy, vet visit.